Public trust in our state government is low. Public opinion polls, such as IPPSR’s annual State of the State Survey, show that the Michigan public’s trust in our state government has been dwindling for years. Crises in some of our largest cities have further eroded public trust in the state government’s ability to represent the needs of our communities. We’ll be electing national, state, and local leaders in November, and some Michigan residents are raising questions about how much their vote matters when partisanship and special interest groups have so much influence on our leaders. In the Center for Michigan’s current public engagement campaign, your voice does matter. We will be gathering feedback on public services delivered by state government, Michigan elected officials and the political process, and perhaps most importantly, your ideas for improving state government services and Michigan politics. Where we find common ground among the problems and potential solutions shared in Community Conversations across the state, we will amplify these ideas to state leaders, so they know what it will take for them to improve public trust in government. These “Restoring Public Trust in Michigan’s State Government” Community Conversations will launch on March 28, and will be the seventh round of statewide Community Conversations facilitated by the Center for Michigan. Beginning in 2007, the Center for Michigan, a 501(c) (3) nonprofit and nonpartisan organization, has spoken with more than 40,000 Michigan residents in community conversations across the state. These engaged Michigan residents, including Bridge readers like you, have shared their ideas for improving our state and have contributed to real policy change in Michigan. In this round of conversations, the Center will meet with 3,000 Michigan residents and gather input on what would improve trust in Michigan’s government. And we need your help. We’re looking for community leaders who can bring together 20-50 people for these critically important conversations. If you are interested in learning more about how to host a Community Conversation, please call us today at 734-926-4285 or email us at engage@thecenterformichigan.net. If you are not able to host a conversation but are interested in participating, please visit our Community Conversation calendar to find a discussion near you. We hope to see you there! The State and Federal governments have proven to us that they think they are smarter than us, above the law, do not need to be transparent and can spend more than they have. Will this be one of those conversations where CFM gives us choices about why we don't trust government, and if one of those choices isn't our reason, we won't be allowed to weigh in beyond the choices CFM gives us? Hi there, I'm Amber DeLind, the Center's Engagement Strategy Director. 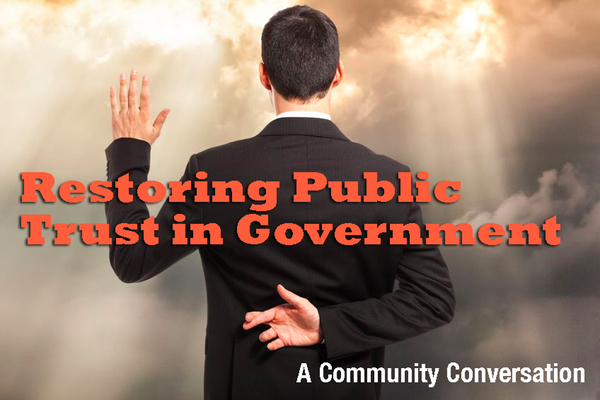 In this discussion, like in all of the previous campaigns, participants will have an opportunity to share all of the reasons that they don't trust government in our open discussions, as well as their ideas for what would improve their trust. I encourage you to attend and see for yourself! You can search by zipcode for a community conversation near you on our conversation calendar: http://bit.ly/CFMconversations. Thanks for your interest! A non-partisan boundary commission to draw up political boundaries to end gerrymandering. In 1978 the Love Canal toxic waste sight was discovered. President Carter stepped in and moved quickly and effectively to ameliorate the situation and out of that grew the Toxic Clean-up Superfund. It was government doing its job to protect the people. Fast-forward 2 years and we get President Reagan saying government can't solve problems because government is the problem. That is when the, "You can;t trust government" movement came out from the shadows and their lie, after being told over and over again began seeping into the public consciousness as fact. Fast-forward 20 years and you find corporate elitists funding a variety of tea party organizations whose primary belief is, "you can't trust government" and the rest is history. As taxes were cut and our ability to maintain our roads, bridges, schools etc was crippled it all became a redundant self fulfilling prophecy. There have been and will continue to be problems between our government and its people and we must always be vigilant and approach these problems with thoughtful refection and action. That is why the CFM community conversations are so important. if you choose to not participate because you lack confidence or trust in government that is your choice but then you just become part of the problem. Democracy is not easy or "point and click" and requires personal effort. If you choose not to put out the effort and just sit back and complain or belittle those who do try to do something that again is your right but you are certainly being selfish and not helping the situation at all. Why not to trust government: 1. Emergency manager referendum ignored. 2. Referendum proof legislation. 3. FOIA exemptions. 4. Gerrymandering. 5. Term limits. Solutions: 1&2. Get rid of clause that allows for referendum proof legislation. 3. Get rid of them. 4. Redistricting done by independent commission; no political party participation. 5. Get rid of them. Term limits do not make lawmakers accountable to the voter. To quote the Beatles: "Got to have a revolution." The "throw the rascals out" solution is attractive like cotton candy but too much can make you sick. Major changes to the way things are done will simply not happen and even if changes happen they will only be band aids. Major citizen participation is required and not just protests. Write op ed pieces like I do, attend community forums like I do, get involved in a campaign like a do. Even go to the capital and speak with your Legislators. If you just sit and complain you have nobody to blame for bad government but yourself. At least actively participating gives you some standing to complain. If you want to regain public trust, then transparency needs to be more than the FOIA 'club'. Transparency needs to be integrated into the daily routine of each government agency, it needs to be part of each of part of the legislatures operations. Transparency starts with stating the purpose of each agency/each program. The next step is with purpose in hand the expected results that purpose will achieve needs to be describe, so all can see. Each agency needs to establish the practices and protocols they will use to achieve the expected results, that should include training of staff, activities and accepted practices, it should include individual roles/responsibilities, and other activities identified as being critical to fulfilling the program purpose and achieving the expected results. Each department/group/active government body would establish a self assessment protocol for verifying conformance to their established practices and protocols. Each branch of government would establish a protocol for periodic verification of the conformance to internal practices/protocols. The verification assessments done by the branches of government would be provided for public scrutiny. Each program would include the purpose, performance metrics, and a required regular reporting of those metrics. In truth this is a government established protocol that they have been applying to private companies for decades. The government agencies add a punishment factor of fines and criminal actions [I would not advocate that part]. If you want trust in government restored you need to realize that the Michigan public has changed, that it isn't the same blind faith and belief that the office makes the person holding that office some how smarter and more effective than anyone else. I say this here as this is not something that would come out in a 'community conversation', they are not structured for such ideas.